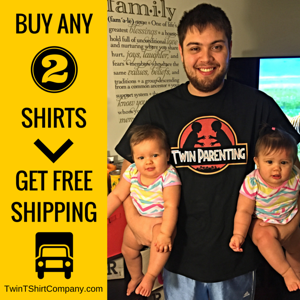 Transporting your twins is a challenge worthy to be included on The Amazing Race. You’re leaving the house with twins? You’re awesome. Pat yourself on the back. However, gone are the days of up and deciding to go somewhere on the fly. Now you find yourself getting the babies (and anyone else) ready to leave at least 30 minutes before you actually need to leave the house. There’s a lot to think about and a lot to remember to make sure outings go smoothly once you leave the safety of your home. So do yourself a favor and let your brain rest once you’re on your way with this one little tip. Get an inline double baby stroller. I can safely say that this piece of baby gear is unequivocally the best purchase we have made to date. Why? It’s light, compact, easy to maneuver, and you never have to disturb a sleeping baby by taking him out of the car seat. Just lift out of the car, snap into the stroller base, and go. Seriously, if you don’t take a single other piece of my advice, take this one: get this piece of equipment. You will thank yourself many times. Once you are done with your inline stroller, you can easily resell it on Craigslist or at a garage sale when you are done with it. Snap N Go strollers are very popular and high in demand. There are a bazillion stroller options out there. 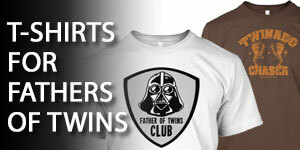 Thankfully, having twins narrows that number to a couple hundred. But really, there are only two basic types: inline and side-by-side. You’ll have to weigh the pros and cons of each kind based on your situation and the way you think you’ll use a stroller. The reality is that you may end up trying both kinds over the course of infancy and early childhood and that different types of strollers will work for you at different times of life. Once our twins could sit up on their own, we switched to a more basic, double stroller like the Jeep Wrangler Twin Sport All-Weather Umbrella Stroller. Since these umbrella-type strollers don’t need the bulky car seat carriers, they take up less space and aren’t such a wide load problem. Not sure what’s the perfect stroller for your twins? 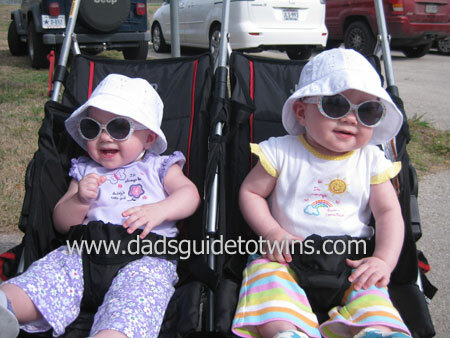 Check out my Twin Stroller Advisor to find the best double stroller for your family. 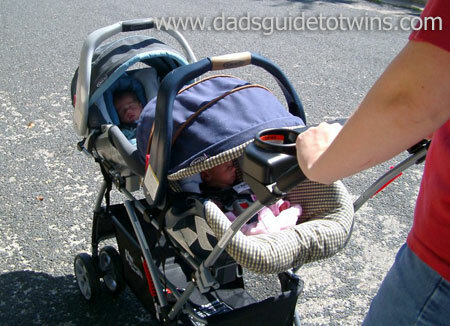 The Double Snap N’ Go is awesome, that stroller made it so easy to take the kids out anytime anywhere. Once their legs got to long though I had to move on to another stroller. It was a hard decision but I eventually settled for a Baby Jogger City Select and it rides like a dream. My only problem is finding a durable travel bag for it. 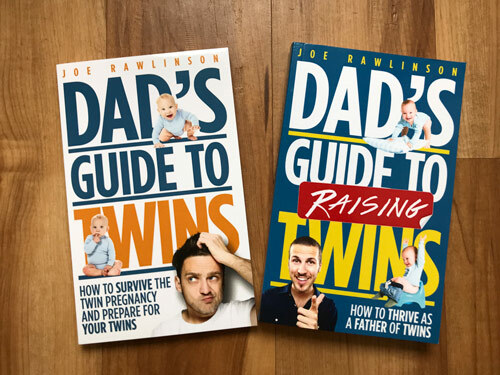 I saw on another article that you have had experience flying with your twins. Have you found or heard of any durable travel bags to store the stroller in once you get to the gate check? One of my problems is size but the other is that it seems most of the bags that they have out on the market are made of thin material and tear easily when handled by the airline. When I traveled with my Baby Trend I just check as is since it was mostly a frame and no seats to be ruined. Although in retrospect the storage bag underneath got a little worn on one side. So know of any durable travel bags or did you just check it as is? @Kimberly – we’d always gate check our stroller right before boarding the plane. It made it easier to move around the airport when we could push our girls in it and gate checked items always seemed to taken care of just fine. I would echo how great the Baby Jogger City Select is. We bought our off of eBay along with the car seat adapters. It is easy to handle and folds up fairly small. The stroller has a solid, sturdy feel to it. What’s great is you can sell it when you are finished with it. They hold their value very well. I have no doubt I will almost be able to recoup what we paid for it when we do. @Jason – thanks for sharing what worked for your family. It is a big win when you can use something and then recoup your cost when you are done. I am expecting twins. I found double snap n go frame, carriers, and car seat attachments, all for $40. Needless to say I am very happy to see your post. I should be trying it out in another month or so! @Jonathan – sounds like you got a good price. We were very happy with our snap n go stroller. Good luck with your twins! @Letha – I believe that with the snap and go, you can put the car seats either forward or rear facing. It will, however, depend on your car seats. @Dave – we really liked our snap n go but eventually moved to a side-by-side anyway. If you’ve found a side-by-side stroller that you like to start with, go for it. Hi Joe, one question. With this snap and go twin stroller, you can you any brand of carrier/ar seat? @Diego – The Snap n Go fits most major infant car seats. However, to be sure it would be best if you can make sure your car seat and the stroller fit together at the store before you buy. We have a girl/boy twins and firstly had joovy stroller where you can snap in the car seats (frame with snap in, not only strapped in), cost about $120. Now when they are bigger we bought Mountain Buggy (world´s narrowest double stroller) and can´t be happier with it. Good luck everybody out there! @Doug – thanks for sharing the stroller that has worked with your twins. 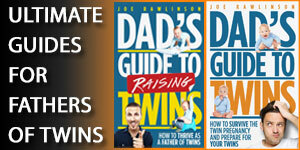 Hello Joe, your blog is very good looking and has many useful tips. 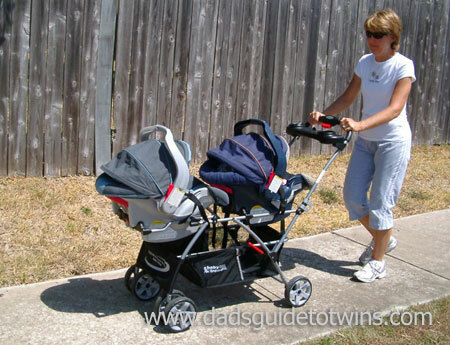 Currently I’m searching for an double stroller and I’m interested the Graco on your homepage. I searched and read an review about this product here: http://doubleumbrellastrollerguide.com/. I think that you have experience on this field, so can you give me more advice about it? Thank a lot. 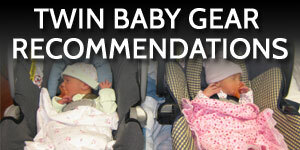 @Marvin – we used Graco car seats in the BabyTrend inline stroller and they worked great. I loved the inline stroller for the triplets I used to nanny. It fit through doorways perfectly. One of the pitfalls when we switched to the side by side is that it didn’t always fit through doorways and we had to break it down to go into stores. What a pain! @Kim – thanks for sharing your perspective! We liked our inline for the very reason you described.